Our last meeting was a memorial service for Rev. Edgar Hamilton at Fairview Cemetery. Reverend Hamilton was the grandson of Alexander Hamilton and began his first pastor-late in the First Presbyterian Church of Deckertown in 1873, remaining ten years, or until 1883, the longest term then served by any pastor up to that point. Mr. Hamilton was born at Hamilton's Settlement, Wis., March 8, 1842. He entered the army at an early age during the Civil War and left the service at the close of the struggle as Lieutenant-Colonel of the First New York Mounted Rifles. This was written by Amelia and Ralph Decker, Historians from the First Presbyterian Church of Sussex. Our second anniversary! With the Sussex Historical Society, we hosted a lecture on women of the Civil War. We will meet at the Manning Ave Cemetery in Butler, NJ. We will be hosting a memorial for 27 Civil War Veterans that are buried there. The cemetery is currently unowned and many of the headstones are damaged. We will spend some time locating all the veterans and memorializing each soldier. Once complete, we will head to the Butler Library for a meeting and induction of new members. We hope to be joined by the local VFW and American Legion members. We will be attending a headstone dedication with the family of Pvt James McGrath....124th NY Infantry Co A, Orange Blossoms. We will have a small ceremony with a bugler for the new headstone with a history of the Orange Blossoms and Pvt. James McGrath. Come on out Saturday July 30th and join us, the newly chartered, Joseph Bessette Chapter of the National Society Daughters of the Union 1861-1865, as we remember and honor some of our local Civil War Veterans. Participants will walk as a group to the old Newton Burial Ground where the Memorial Service will be held for the nineteen Civil War Veterans that are known to be buried there. The Memorial Service will include placing flowers on the graves of all the Civil War veterans. At the closing of the service, Jeff Heagy, a member of Buglers Across America will play taps. 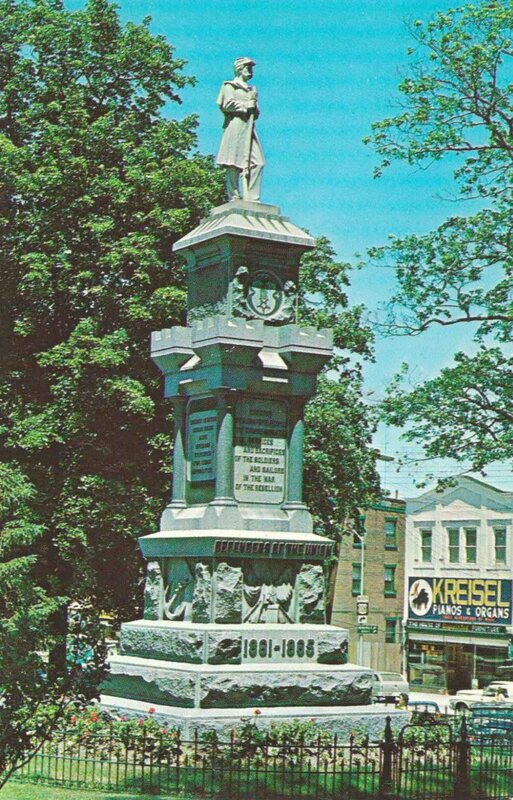 Following the Memorial Service, participants will then proceed to the Village Green, where standing by the "Man in the Park" Civil War Monument, Sussex County Historian Wayne McCabe will present a talk on the "Defenders of the Union." Participants will then return to the Museum where Civil War memorabilia will be on display. Saturday April 30th will be our official chartering! National Organizing Secretery, Phyllis Lawson will be flying in to conduct the ceremony and to hand us our official Charter. Members and guests are welcome to celebrate our special day!